It’s 3:17AM. You’ve been staring at the clock since 1:42AM, mind racing, body tense. In five hours you’re going to have to drag yourself to work, terrified that you’re going to fall asleep at your desk—again. If you have trouble sleeping, you’re not alone. I know what it feels like to lie awake, reliving mistakes, making lists of things that might go wrong, waiting for sleep that never seems to come. In fact, almost one-third of the adult population in the US has trouble falling asleep from time to time. Ten percent of us have long-term insomnia, which means we struggle to fall asleep at least three nights a week for over three months. Whether you have a wakeful night once in a while or find yourself lying awake all the time, here are some new ways to think about and deal with insomnia that could change the way you feel about those sleepless nights. Using the following Feng Shei techniques can help turn your bedroom into a sanctuary that invites relaxation and encourages a good night’s sleep. Begin by getting rid of anything in your bedroom that isn’t useful, or doesn’t bring you joy. Clean out the clutter from under your bed, the back of your closet, and all your drawers. Dust out the corners of the room and make your bed. According to the National Sleep Foundation, people who make their beds are 20 percent more likely to get a good night’s sleep. Remove or turn off as many electronics as possible. If you choose to have a phone or personal device in the room, keep it as far from the bed as possible. That blue light from your device can inhibit the production of melatonin, which helps you fall asleep. Once your bedroom is clean and clutter-free, turn it into a welcoming retreat by finding ways to appeal to your senses. First, surround yourself with soft colors. Focus on pastels or earth tones, no black floors or walls. An occasional splash of vibrant color is fine, but the overall effect should be soothing and peaceful. To bring balance to the room and help you feel safe as you sleep, make sure the head of your bed is against a wall, the bed is easily accessible from both sides, and the bedside tables are a match in size and proportion. If you’re bothered by noise, try using a white noise machine, or play some soothing music to help you unwind. To appeal to your sense of smell, use a diffuser with scented essential oils. Lavender and jasmine are great for helping you relax. Every fabric that touches your skin should be soft and inviting. Your sheets should be the best quality you can afford. If you haven’t replaced your pillow in this century, it’s time for a new one. Your mattress should support your weight comfortably. If it’s more than ten years old or it sags in the middle, replace it. Making your bedroom into a safe, comforting sanctuary is a wonderful way to help ease insomnia. Acupressure works by removing energy blockages in your body and restoring the flow of qi, (life energy) throughout your body. This renewed flow of the life force helps bring a sense of calm and balance to your body, mind, and spirit, paving the way to a good night’s sleep. To find this point, place your right thumb on the horizontal crease of your left wrist, in line with your little finger. Press or massage the point gently for a minute or two, while you breathe deep into your belly. Repeat on the other hand. Continue, alternating sides, until you feel both your body and spirit relax. Begin by lying on your back in bed, arms at your sides. While your heels remain on the bed, lift your toes so your feet are at right angles to your legs and you feel a stretch up the back of your legs. Turn your palms toward your thighs. Clench your fists and curl them inward until you feel a stretch in your wrists. As you squeeze your fists as tightly as possible, lift your head and look at your toes. Breathe in and hold your breath to a count of four. Then breathe out with a whoosh, relaxing your body at the same time. I suggest you repeat this pose up to six times or until you’re fully relaxed and ready to drift off to sleep. If you’re like me, you may have had no trouble getting to sleep, but find yourself wide awake in the middle of the night. And if you’re a worrier like me, you can lie awake for hours, worrying about the undone project at work, the annoying thing your sister said, or the strange noise your car’s been making. Worst of all is the fear there’s something’s wrong you and that you’ll never sleep again. Believe me, I know all about the vicious cycle of worry leading to insomnia, and insomnia leading to more worry. What broke that cycle for me was learning that waking up in the middle of the night is a perfectly normal function of the human body. Believe it or not, before the invention of the light bulb brought us artificial light, people traditionally slept in two distinct segments. The first segment of sleep began in the early evening (starting between 7:00pm and 8:00pm). This first sleep was followed by a wakeful period of a few hours in the middle of the night (usually around midnight) and was followed by a second sleep through morning. For thousands of years, people used this time to think, pray, read, or even go visiting. Today research suggests that the time between those sleep segments is a good time to meditate, create and imagine. Once I understood that segmented sleep was normal, I stopped yelling at myself for being awake, and I stopped trying to force myself to sleep. Instead, I began using those wakeful hours as an opportunity to reimagine my environment, rethink my self-care, and reconnect with both my spirit and my creativity. How about you? Does the idea of segmented sleep change the way you feel about your insomnia? Can you think of any way you could use that time to improve your life? Here are some techniques I use that you might find helpful. Try them all, and see what works best for you. If you already have a meditation practice, this quiet time is perfect for making a connection with your inner spirit. If you don’t know how to mediate, or find meditation difficult, just start noticing your breath as it moves in and out of your body. With each inhale, focus on the word “in.” With each exhale, focus on the word “out.” Notice how cool the air is as you breathe in, how warm the breath is as you breathe out. As you continue breathing, notice how, over time, your body relaxes and continues to sink deep into an ever-growing sense of peace. If you have trouble meditating on your own, listen to a guided meditation CD or app. Instead of spending time reliving all the missteps and mistakes you’ve made in the past, why not use this time to focus on all the things that have gone well? All right, maybe you’re going through a tough time. Maybe you’re dealing with a recent loss or are facing a difficult challenge, and you’re struggling to find a single thing to be grateful for. Don’t give up. I promise you, no matter how bad things seem right now, there’s something in your life to be grateful for. Look for small joys, moments of pleasure or unexpected beauty. Are you grateful for the warmth of your bed? Or that you have a great support system? Maybe you’ve recently enjoyed a great meal, or heard a song that you liked. Be gentle with yourself. Just coming up with one or two things you appreciate can make a big difference in how you feel and how you sleep. If things are going well in your life, why not make a game of seeing how many things you can come up with to be grateful for? Can you find ten things to celebrate? A hundred? More? A positive shift in your thinking brings an inner sense of calm that can help you ease into a restful sleep. What if you used this peaceful time to let go of an old hurt, anger, hate, or shame? The burdens you’ve been carrying around for so long, weigh you down. Releasing them can make your life easier and your sleep more restful. Think a minute. Is there someone you could forgive? Is there a situation you would like to put behind you? Do you need to forgive yourself? If you’re ready to release this old pain, begin by focusing on the person or situation you would like to forgive or let go. When you bring it, or them, to mind, what do you feel in your body? Where do you feel it? To let go of that pain, put your hand over the place in your body where that pain lives. Now, imagine that pain is slowly dissolving under the heat of your hand and draining out of your body into the ground below. As you breathe out, let go of those old hurts. As you breathe in, welcome a new sense of light and love. Continue until you feel a deep sense of calm and you gently drift towards sleep. Finally, if you still can’t sleep, consider getting up and doing something restful or creative. This is not a time to tackle a work project, answer emails, clean, or do anything that causes you stress. This is a time to explore who you are, and to get in touch with your heart and your soul. Sip a cup of herbal tea. Read something that uplifts your heart. Do a puzzle. Knit. Gaze up at the stars. Follow the path of the moon across the sky. Just sit and soak in the peace and quiet. Try a yoga pose or two if that feels relaxing, or maybe take a warm shower to help ease any muscles that feel tense. This is also a great time to write, or draw in a journal. (It’s better to go old school here and use a paper and pen. The blue light from a personal device can keep you awake). You could also use this time to sketch, write music, write a poem, or try your hand at that novel you’ve always wanted to write (but no working on anything that causes you stress. The idea here is to enjoy the act of creation, not to judge or critique your work). Another idea is to write a letter of gratitude to someone who helped you when you needed it, or a letter of encouragement to someone who could use a kind word. Or you could write a letter of encouragement and support to yourself. After twenty minutes check back in with your body. How is it feeling? Are your shoulders relaxed? How about your belly? Your jaw? If you’re feeling physically relaxed and emotionally calm, try going back to bed. If you’re still tense, wait another twenty minutes, then check in again. At that point, no matter how you feel, climb back into bed for twenty minutes knowing that it’s perfectly normal to still be awake, and that you will eventually fall into a deep restful sleep. No matter what’s keeping you awake at night, there’s always a way to bring some light into the darkness, to care for your heart and soul with kindness, and to love yourself through the night. Wendy Leeds is a psychotherapist and a cancer survivor. She knows what it’s like to face anxiety and trauma, and she’s working on a book to share her experience and expertise. Wendy’s CD, Creating A Calm Day, is available on Amazon here. Wendy offers the gift of her B.E.A.R. technique for handling panic on her website, wendyleeds.com. Join Wendy on Facebook at @WendyLeedsKeepingCalm. 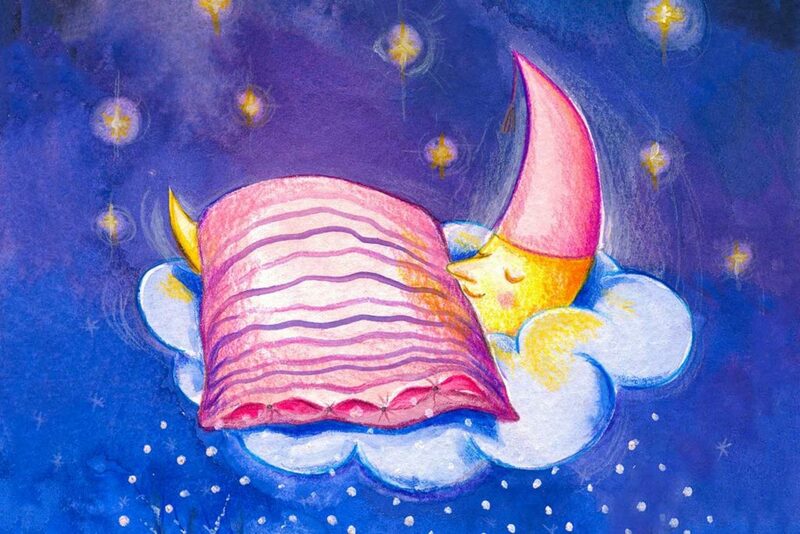 The post A Spiritual Approach to Beating Insomnia and Getting a Good Night’s Sleep appeared first on Tiny Buddha.